Sweet Rocket – Dig Delve – An online magazine about gardens, landscape, growing & making. A year ago now, and with the prospect of planting up the final part of the garden in the autumn, I wanted to add some variety to the range of plants that was available from my favourite nurseries. So, I set about sowing some additions from seed, to feel that I’d grown them from the very beginning and to understand them fully. Bupleurum perfoliatum and Aquilegia longissima were needed in quantity to weave into the new planting and to jump around, as if self-sown. It was also good to revisit plants that have become hard to obtain, such as Aconitum vulparia, a creamy wolfbane from Russia which I’d grown as a teenager and had a hankering for again. The success stories of the plants I knew and understood were reassuring. Those that I didn’t, vexing but fascinating nevertheless. It is a mistake to throw out a pot of seed that hasn’t germinated within a year, because it may simply be waiting for its moment. The Viola odorata ‘Sulphurea’ needed the freeze of a winter to break dormancy and I learned by chance that Agastache nepetoides needs light to germinate, and so should be surface sown. My usual top dressing of horticultural grit, used to prevent moss and as a slug repellent, was washed from the sides of a pot by a leaky rose, opening up a window of opportunity, the seed germinating there and there only to burn this fact into my memory. Some seed may have been too old by the time it was sown, with very poor germination on the Anemone rivularis, but the small numbers mean that the plants that made it are that much more precious. Although the value of seed-raised plants increases when you have tended them from their vulnerable beginnings, it is also good to feel that you can be generous, because some plants are just so easy. Having grown the biennial Lunaria annua ‘Chedglow’ the year before, the first plants had all flowered and seeded so an interim generation was needed to set up a continuity. The large, flat seed threw out fat cotyledons in a matter of days and the distinctive purple-tinged foliage was already there in the first true leaves. 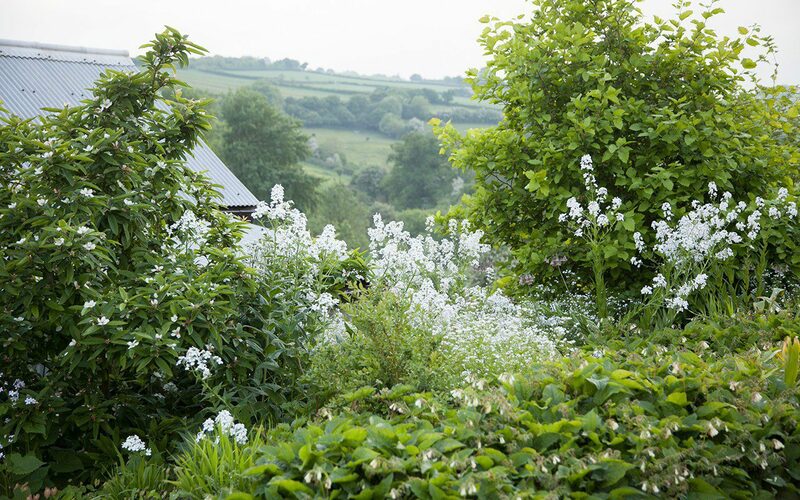 Where the perennial Anemone rivularis took their time to build up strength for the life ahead of them and had to be watched because they were so slow, the pioneering nature of the Lunaria means that you have to keep up to make the most of the growing season. The seedlings were potted on into 9cm pots as soon as the first true leaf was properly formed, handling the seedlings only by their cotyledons and never their vulnerable stems. With the new opportunity of their own space, they worked up a rosette last summer that was hearty enough to plant in the autumn and bolt the early spring of flower a year after sowing. 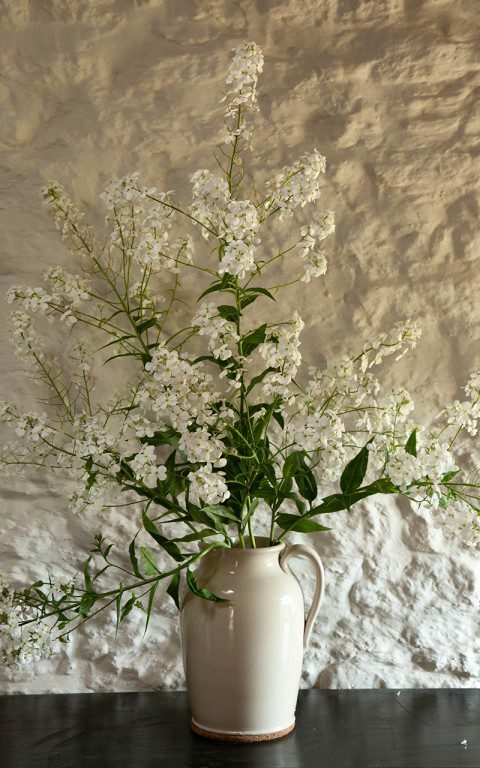 Of the short-lived perennials I’ve used to provide for me early on in the life of the establishing garden, the Hesperis matronalis var. albiflora have been good to revisit. The white sweet rocket was a plant of my childhood garden, where it had sprung from the clearances of brambles like a phoenix from the ashes. Rising up fast with the cow parsley and easily as tall, its early flower bridges late spring and early summer. I have not had room to grow it for a while, because its ephemeral nature this early in the season can easily smother neighbours, to leave a summer gap when you cut it back to the rosette once it’s done. Let it seed and you will find a rash of youngsters, for it is also a pioneer that sees seedlings bulking up over summer in readiness to conquer new ground the following spring. This eagerness can easily be tapped, and it is good to leave a couple of limbs to go to seed as the plants are only good for two or three years before they exhaust themselves. 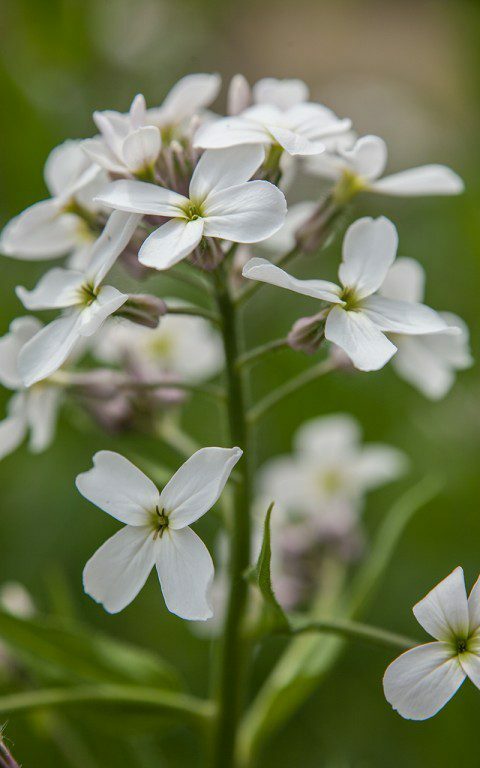 Sweet Rocket are adaptable to both an open position or to dappled shade, but the advantage of a cool position is that they grow less vigorously and take less ground. Mine were interspersed randomly in the planting to perfume the steps that descend to the studio and their distinctive, sweet scent is held in the stiller air caught behind the building. Bulking up fast once they were released from their pots, they have provided me with a rush of new life that has outstripped but complemented their slower growing neighbours. Seed-raised plants are more often variable and this is one of the joys of growing your own. Of the twenty or so plants, I must have almost as many different variants. There is a blowsy head girl, brighter and showier than its neighbours and probably the one you would choose as a complement to a Chelsea rose garden, although she leans and topples under her own weight of flower. There is a perfectly behaved plant nearby. Just as white, but smaller and quieter and perfectly happy to stand upright without staking. This is probably the one that you would propagate from spring cuttings if you wanted something showy and reliable. My favourites have a wilder feel though; a grey-pink cast to some and more open flower panicles to others that provides the space I am so keen on and a lightness in the planting that feels less dominant. Head Girl has been used for cutting and will come out when I cut the plants down to prevent it from seeding and allow my slower-growing perennials around them the room they need to fill out later in the summer. 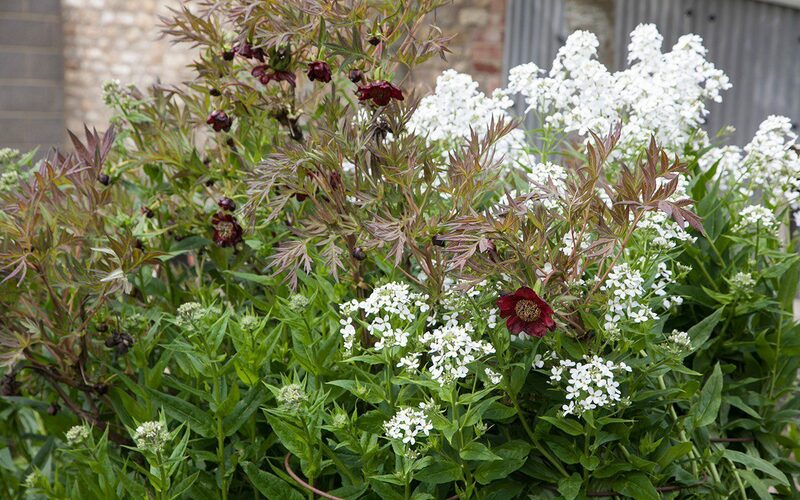 Though the Actaea, the Zizia and the peonies are destined to provide a more certain future, the fast sweet rocket will always be just that.